Several diseases and conditions can turn your perky little cyclamen into messy yellow leaves and dying blossoms. Can diseased plants be saved? 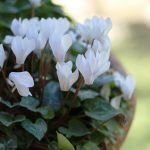 This article focuses on tips to help you prevent cyclamen plant diseases so that you don’t have to throw away your plants. Before you decide something is wrong, remember that the leaves on a healthy cyclamen plant turn yellow and drop off in summer. This is perfectly normal—the plant is just preparing to go dormant. After a summer nap, the leaves regrow. Indoor cyclamen diseases infect plants during the winter growing period. There is no cure for many of these diseases, and the best course of action is to discard them before the disease spreads to other plants. Cyclamen plants aren’t very expensive, and they are difficult to bring back into bloom after the first flush of flowers. For these reasons, many people simply replace their plants when problems develop. If you decide to try caring for sick cyclamen plants, keep them isolated. Wear an apron when working with diseased plants, and don’t wear the apron outside of the immediate area. Wash your hands and thoroughly disinfect tools with a household disinfectant before working with healthy plants. Bacterial soft rot and Fusarium wilt cause the entire plant to rapidly turn yellow and die. There is nothing to do but discard the plant. To prevent these cyclamen diseases, buy corms from reputable sources and plant them in clean media. If you are reusing a pot, scrub it out thoroughly with a household disinfectant or a weak bleach solution before planting. Botrytis blight causes tan leaf spots. Flower petals look water-soaked at first, and then they develop tans spots as well. The whole plant might be covered with gray fungus. You might be able to save your cyclamen if you catch the disease soon enough. Place it in isolation and run a fan to improve the circulation. The disease is contagious, so keep a close eye on plants that may have been exposed. Leaf spot causes round spots that can be yellow, gray or brown. If you look closely, you’ll see black dots inside the spots. Isolate the plant to keep the disease from spreading. Try to avoid getting water on the leaves or the crown when you water the plant. 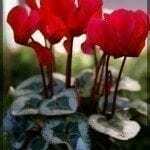 If you can’t water cyclamen from the top without wetting the leaves or crown, water from the bottom. 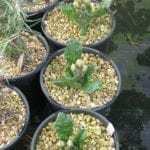 Thielaviopsis root rot causes stunted plants. If you check the roots, you’ll find that they are black and shriveled instead of plump and white. Discard plants infected with this disease. Viruses cause a number of symptoms, including misshapen, deformed leaves and flowers, and abnormal color patterns such as streaking and ring spots. If you suspect your plant is infected with a virus, discard it immediately.